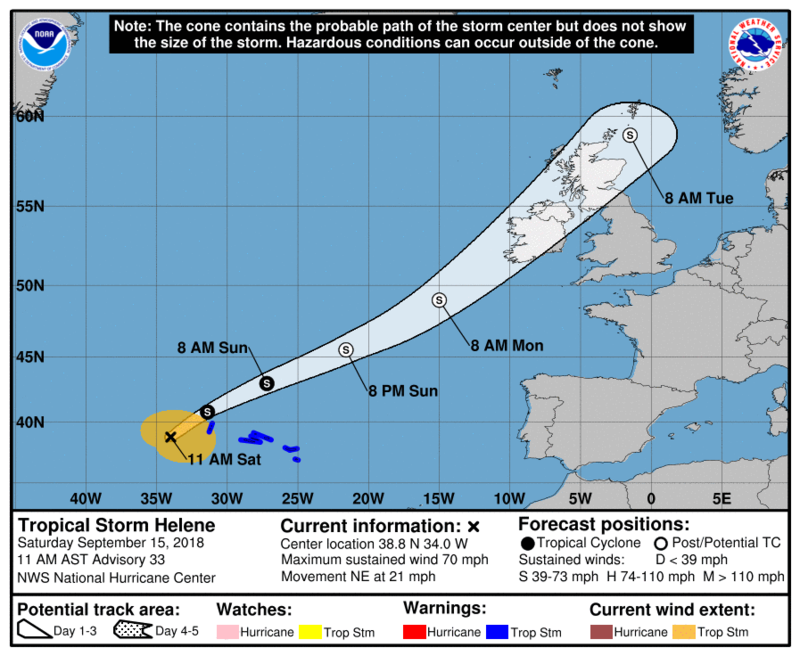 Helene maintains Tropical Storm status in the latest advisory from the National Hurricane Center as the system approaches the western Azores in the central-eastern Atlantic. Transition to ex-tropical Storm Helene or “Storm Helene” is expected by Sunday evening. The Storm is expected to turn northeastwards with an increase in forward speed as it heads towards Ireland and the UK. The latest guidance has shifted the forecast track of Storm Helene a little westward from yesterday with the centre of the low now tracking up over parts of Ireland instead of mainly up through the Irish Sea. That said, there continues to be large uncertainty in the exact track. Timings are also a little variant, however it still looks as though the main impact will occur on Monday evening/night and early on Tuesday. Yellow level impacts from wind are looking increasingly likely for coastal districts of the east and south, with strong gales or storm force winds for a time in the Celtic and Irish seas. Short interval intense rainfall may occur in places, but due to the speed at which the system is moving through, it is not envisaged at this stage that a rain warning will be required, although this aspect will continue to be examined more closely once our high resolution model guidance becomes available on Sunday. Met Éireann forecasters will continue to monitor the situation and issue warnings, as required, closer to the time. Image courtesy of the NHC.